My co-workers were raving about this recipe. I can’t lie, when I heard that the truffles were just a blend of Oreo and cream cheese, coated in chocolate, I thought. “Gross, there is no way these are as good as they are making them out to be.” But, I had ½ a pack of Oreos leftover from my creepy cupcakes (Flog soon to come! ), so I gave them a try. I’m happy to report I was wrong – they are creamy, rich and delicious. 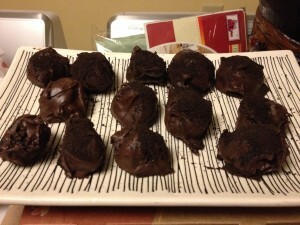 They were a hit at the party and are amazingly easy.